When the Maplecrest Apartment Complex was left under water, Jeff, the on-site assistant manager, contacted Kelley Construction right away. As a result of standing water, the apartments were left with wet floors and walls. Jeff needed to be able to rely on someone who could also work with his insurance company to get the apartment complex back up and running for his tenants. Since insurance restoration is one of our specialties, our team at Kelley Construction worked directly with Maplecrest’s insurance company to ensure the process went smoothly and efficiently. 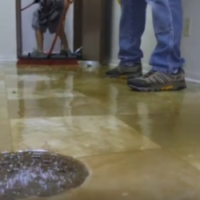 We knew that Maplecrest’s business was at stake while renters couldn’t live in their apartments, so we went above and beyond to provide flood damage restoration services that included getting rid of the water, drying the floors, cutting out damaged drywall, and replacing new flooring and walls as needed. In a matter of no time, Kelley Construction restored all of the damaged apartments at Maplecrest, not only just getting rid of the damage, but leaving them in even better condition than before the flooding. Check out what Jeff has to say below!